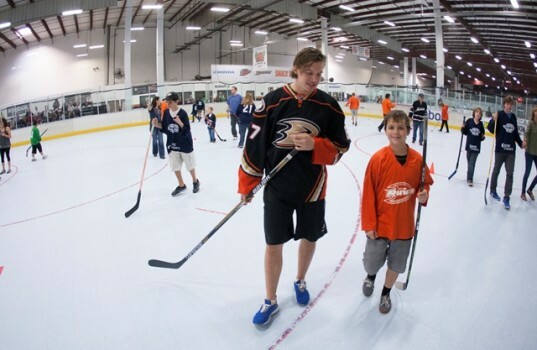 Anaheim Ducks defenseman Josh Manson and center Rickard Rakell put their skates to the side and laced up some tennis shoes to participate in Top Flight Street Hockey at The Rinks – Huntington Beach Inline. Top Flight is a street hockey league designed for participants with special needs and is open to all ages and abilities. Now in its second year, Top Flight includes a weekly practice and game as well as provides players with their own jersey, stick, and trophy. Manson and Rakell took part in on-rink drills and served as guest players for both teams. “Hockey is a game that every person should be able to play at least once in their life, and to be able to come out here and give them that opportunity, it’s just great,” said Ducks defensemen Josh Manson. After the game, Manson and Rakell signed autographs and took pictures with all of the Top Flight players.